ABANG Man wears a forlorn look on his face. For the last 15 years, Abang Man was the chief of an Umno branch in Kuala Lumpur. Energetic and always full of life, Abang Man was always there when you needed him. At funerals, weddings, gotong royong and meetings at the local parent-and-teacher association, Abang Man was ready to lend a helping hand. As an Umno grassroots leader, Abang Man considers it his duty to join these activities. But two weeks after the historic defeat of Barisan Nasional at the May 9 general election, the father of four school-going boys had disappeared from public view. No sign of him at the Ramadan bazaar, not at the local surau and not at his favourite restaurant, where he used to hold court. The thrashing had reduced Abang Man to that of a dejected and confused leader. I tracked him down to a quiet coffeeshop for a chat. “Saya dah give up, (I’ve given up)” Abang Man said in a tone that reflected his mood. Apparently, Abang Man was not alone. Another grassroots leader outside the city wore the same look. Pak Mat was just as dejected as Abang Man. Since Pak Mat lived in a kampung, he had nowhere to hide, and was forced to face the sneers and cynical remarks by some kampung folk. Both leaders face similar situations at their branches — both held their annual general meetings a few days apart but with similar outcomes — no one wants to serve the party! So, both branches were forced to have Abang Man and Pak Mat as leaders, at a time when both were ready to give up and make way for new faces. But herein possibly lies one of the big reasons why BN lost the election. The fact that leaders refused to make way for younger talent meant the so-called regeneration of the party did not take place. Party leaders at various levels talked so much about wanting to regenerate the party, but it never really got going. Since Umno is the dominant force in BN, much was expected of the party. After BN lost the two-thirds majority and five state assemblies in the 2008 election, the ride had been downhill. It finally ended with Pakatan Harapan wresting control of the Federal Government. It also added Melaka, Negri Sembilan, Perak, Kedah, Johor and Sabah to Selangor and Penang to the list of states under its control. Today, Umno finds itself on the opposition bench at the Dewan Rakyat, and many state assemblies. It’s a new role for their elected representatives, one they are not accustomed to. Umno’s rebuilding, if they are serious about it, starts in this august environment. In the past couple of weeks, Umno leaders have been making statements about choosing a new line-up of party leaders. Many names have been tossed up, including bringing back into the top hierarchy leaders like Gua Musang member of parliament Tengku Razaleigh Hamzah. Ku Li, as he’s fondly referred to, is not averse to this possibility. He hosted iftar at his house a few nights ago with Umno leaders, signalling his willingness to discuss possibilities. This is an interesting development and we must follow this closely. Another Umno leader, who has held key party positions at both national and state levels, gave a more insightful view: “Umno must get rid of the stigma that it is arrogant, conceited and selfish. “For years, many Umno leaders promoted themselves as know-alls. But many are intellectually shallow. The ‘cash is king’ mindset has spoilt the party to its core. Today, Umno appears to be bankrupt of ideas to rebuild itself. “Why do I say that? Simple. Umno members on the ground are running around in circles. They have a million questions about the party, but there’s no one around who can shed light on the future of the party and its new direction, if any. I see this whole episode quite clearly. At the very bottom, party members see a hopeless situation. 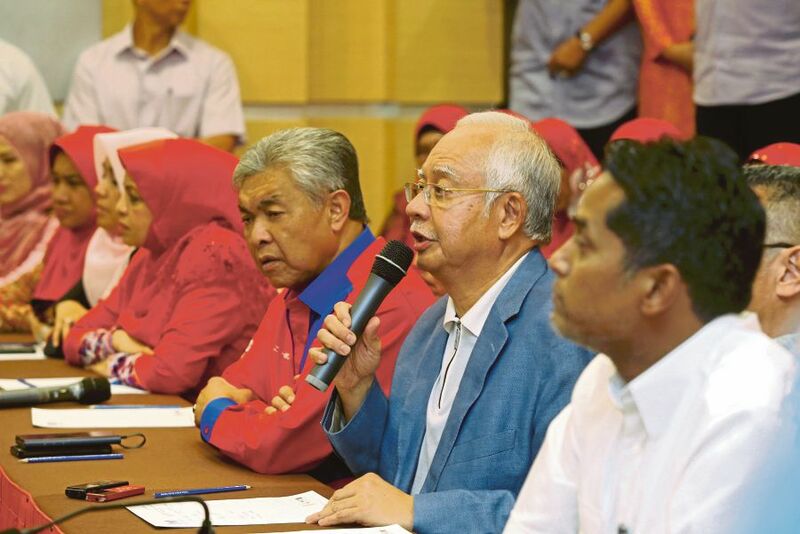 At the top end, the party has yet to accept reality, preferring to point fingers at what they refer to as Pakatan Harapan’s dubious tactics during the polls. Really, Umno? Wake up! The sooner the party faces the new realities of Malaysian politics, the better. Many people want Umno to be a strong opposition. More than that, Umno has to be a credible opposition. How can they be a strong and credible opposition if they can’t see through the maze moving forward? The sooner Umno accepts the fact that it is no longer the government of the day, the better. And that cash is no longer king. Umno needs fresh narration. Umno certainly needs a strong leader with new vision and clarity of thought to pull every single member by the throat and head back towards to the command centre, regroup and articulate the way forward. Can Ahmad Zahid Hamidi do that? Or Khairy Jamaluddin? Is the party looking to Ku Li to lead it out of the trenches? Many party leaders are tainted, painted with the same brush that gave a widespread picture of greed, corruption, abuse of power and arrogance.